Description: A session manager that lets you save and manage multiple sessions. * BrowserAction Edition 0.1 released. This is a new BrowserAction version. Something to use when ToolStrips are deprecated. It currently only has save support, and it saves to "Other Bookmarks\\Your Saved Sessions" in a timestamped sub folder. You need to use BookMarkManager to load your session back. ** Loading a session goes to last selected window, makes it easier to restore multiple sessions at once to separate windows. ** Chrome 4.0.206.1 support added. ** Export to Bookmarks - Exports all saved sessions to bookmarks under "Other Bookmarks\\Your Saved Sessions" in a timestamped sub folder. 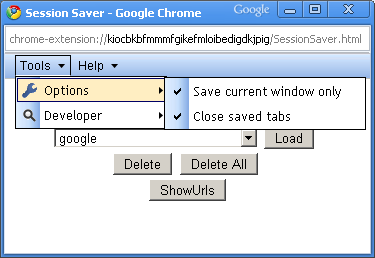 ** Save current window tracks all windows, ignoring dev tools and session saver windows. ** System tests to replace some manual testing. ** New option: Save current window only. ** New option: Close saved tabs. ** Bug Fix - Chrome 4.0.201.1 support added (permissions in manifest). ** Tools menu containing some developer tools - unit tests, toggling logging etc. ** Help menu containing link to this forum. ** Bug Fix - Occasionally multiple [SessionSaverSettings] bookmark folders were created, which caused session data loss when an out of date folder is loaded. Multiple bookmark entries are now deleted, and a safeguard is in place to ensure only 1 entry is created. 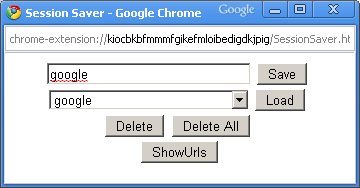 ** Bug Fix - When showurls active, doesn't keep saving data (was thrashing bookmarks). * 0.12: Bug fixed - When you delete an entry, and load a session after the deleted one, it loads the incorrect one. The ids are now correctly reset on deletion. * 0.11: The window closes when you save or load. * The callback systems present in bookmark functions. It seems tricky to get the order of execution right. Plus you can't search for folders, or search within an existing parent. * Context menus for toolstrip icons. (looks like moles may finally make this possible). The code still needs lots of cleaning up, but I think its ready for general use. If you like this tool, also try Chrome Sticky Notes. You can copy/paste urls from the Session Url Viewer into the Sticky Note, highlight some and click "visit links in selection". Also try JW's Session Save - Bookmark current session. I found it useful to learn from when implementing the export to bookmarks feature. * Description: I've been working on a tool to let you save and manage multiple sessions. ** Saves all tab urls for all chrome windows. ** Saves multiple sessions with custom names. 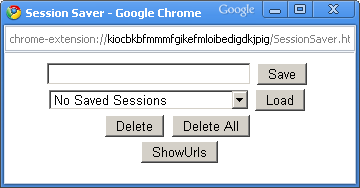 ** Loads all urls from saved session to current window in new tabs. ** Can view all urls to copy/paste from. The code currently needs lots of cleaning up, but I think its ready for public testing. "Context menus " .. aint that the mole feature (that never seem to get finished) ? I really like this allot, very useful to me. 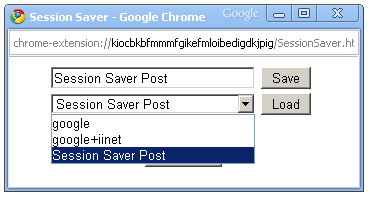 Would like it when you clicked the Load button the window closed or alternatively when you clicked the toolstrip button and a session saver window was allready open it would come to the front and not open another window (if either of these things are possible). Thanks allot, I love it. Thanks for the feedback. I wanted the close window ability too, but chrome crashes whenever I did it (it would have made saving way easier - no need to dynamically fill the selectbox). So now in 0.11 the window closes when you save or load. 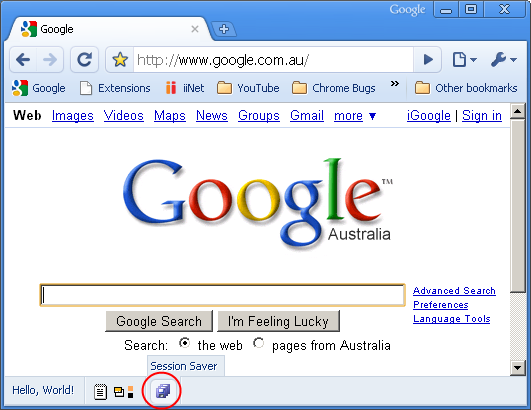 do you require feedback from Chromium users? Yeah it would be useful to find any remaining bugs and find out if there are any significant features missing. Thank for the update, this really is usefull. after loading a session, would it be possible for all other tabs close (not related to the session) ? does this extension update automatically ?